I'm using a recipe for rough puff/quick puff pastry as the dough. The filling is cheddar cheese and pimentos. After baking at 350 degrees F for about 35 minutes, they are a little over done on the outside and gummy on the inside. I've baked these before with different fillings without this trouble. Is the cheese the culprit? Is there too much fat involved? Any suggestions on how to make this work with some modification? One picture shows the outside of the rolls. The other picture shows the inside when it's cut in half. 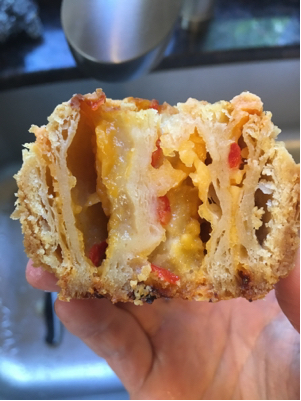 When you did different filings before, I suspect they took less heating up, and that your cheesy filling is stopping the internal temperature getting as high as it should. This could be because the cheese goes on fridge cold and has a higher heat capacity than whatever you used before. The water content of the pimentos and cheese may also not help. In terms of a solution you need longer for the heat to reach the middle. I doubt just starting with the cheese at room temperature would be enough. 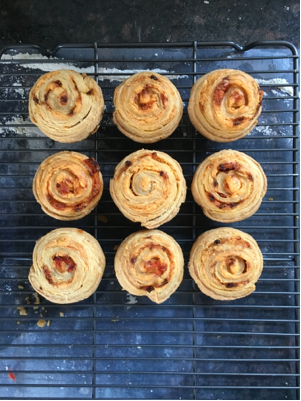 To avoid browning too much you'll need to reduce the oven temperature, but not by too much or the pastry will be too pale and again not cooked through. This will take a little experimenting, especially if you take the approach of preheating the oven to the current recommended temperature and reducing the temperature when you put the food in (which can work well but depends on how well your oven is insulated). I work in Celsius but rounding my guess you might turn it down to 320F when you put them in. Not the answer you're looking for? Browse other questions tagged baking cheese or ask your own question. How to bake lokum rolls well? Can these settings bake a cake? Can meat and cheese be stored together? How to make part bake baguettes and rolls?